Login and access to the NSW Major Trauma Data Visualisation tool is restricted to authorised staff members of NSW trauma services and ITIM. Access to the system has been linked to NSW Health stafflink. 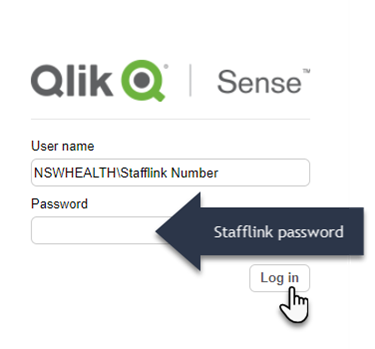 Username and passwords are 'NSWHEALTH\' and your stafflink (employee) number and stafflink password. To request access to the NSW Trauma Data Visualisation tool please see the NSW Major Trauma Visualisation tool webpage. 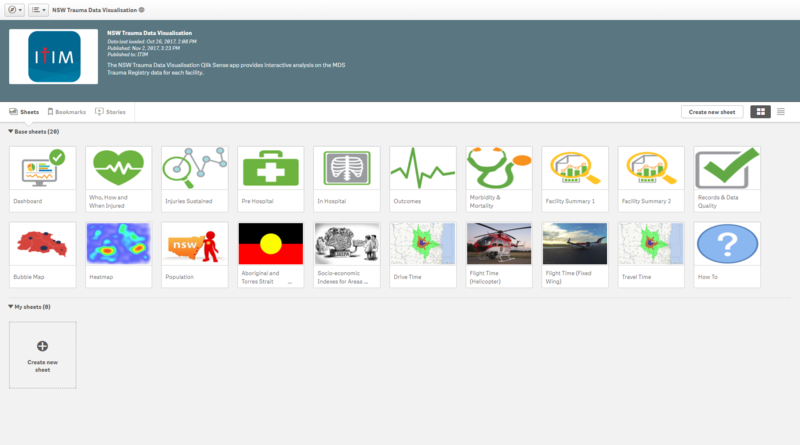 The NSW Major Trauma Visualisation tool uses a software called QlikSense, once logged in the software will launch in the webpage that you have open. Work—Where you edit your existing apps and create new ones. 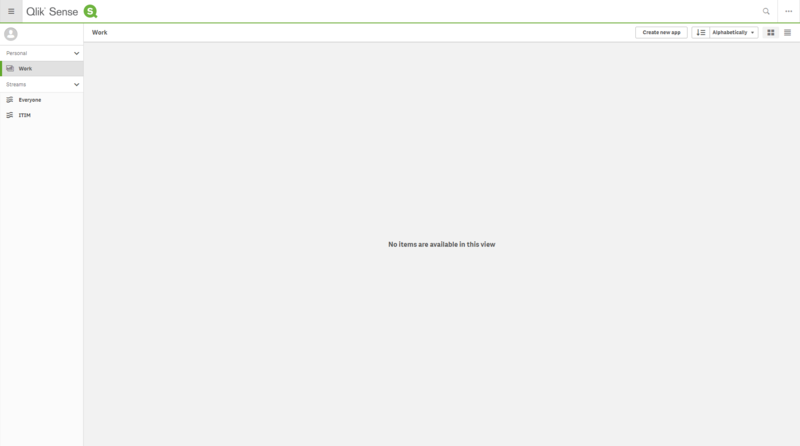 Stream—Where apps that have been published by a system administrator are organized. 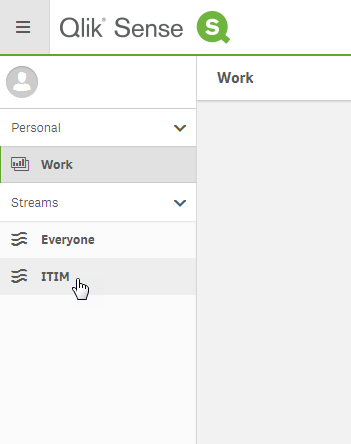 The Everyone stream is the default stream but additional streams are usually created to satisfy access requirements. 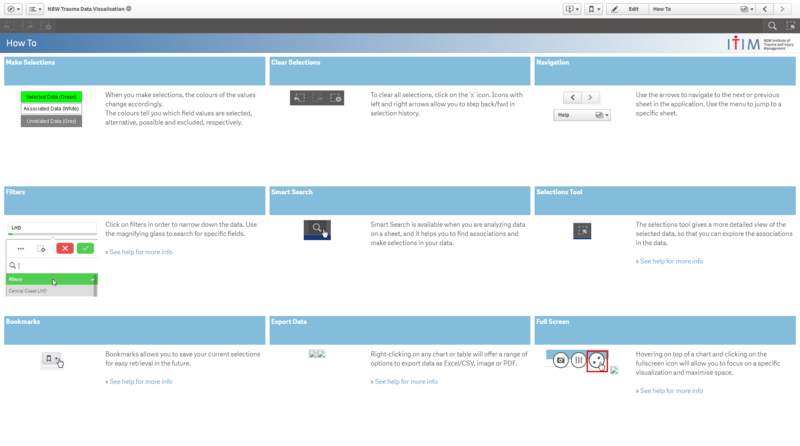 A QlikSense 'app' is a collection of reusable objects such as sheets, bookmarks, stories, measures, dimensions and predefined visualisations. The NSW Major Trauma Data app is called 'ITIM' and can be accessed from the Left hand margin, as shown below, under the 'Streams' menu. 'Sheets' contain charts, tables, images and filters creating an interactive data visualisation experience. The NSW Major Trauma Data app includes several pre-developed sheets. The sheets within the app have been created to follow the same flow as the NSW Major Trauma Data Reports with the addition of some custom visualisations and GeoAnalytics that combines Geospatial data and trauma data. Selections made in one sheet affect visualisations in another sheet. What is the NSW Major Trauma Data Visualisation Tool? This will allow the for all trauma centres to easily visualise the trauma data for their centres. The application will show visualisation (e.g. interactive charts, graphs and maps) which will allow the user to drill down into the data which is currently not possible. This application is run by a software called QlikSense. Will it replace Report Writer? No, Report Writer is a data query and extraction tool whereas QlikSense Trauma application is a data visualisation application. Both will coexist and fulfil different functions. What data will be displayed? Only patients that meet Minimum Data Set (MDS) criteria will be displayed in the visualisation tool. Each trauma service will only have access to their own data. ITIM will maintain a view of all trauma data for monitoring of the system. Will trauma services need to extract data from Report Writer? No, ITIM will conduct a data extraction from Report Writer on a monthly basis. An email will be sent prior to the extract occurring requesting where possible that data is checked and entered into collector. If a trauma service has been collecting custom or non MDS data elements the service can extract this information locally and import the data into the system for localised analysis and reporting. Will Trauma Services need to build the visualisations? The NSW Major Trauma Data Visualisation Tool comes with 10 prebuilt visualisations, referred to as ‘sheets’, that have been standardised for the NSW trauma system and are based on the Annual Trauma Data Reports. In addition to this, ITIM has developed 6 Geospatial map visualisation sheets. Training was provided earlier this year to interested trauma service staff. These staff members have been trained on how to develop additional sheets and import custom data into their services instance of the application. If a trauma service requires a custom sheet created ITIM is able to assist. How will I get access to it? NSW Major Trauma Data Visualisation tool will be accessed through the NSW Major Trauma Data Visualisation tool website by authorised users at ITIM or the NSW Trauma Services. For convenience, the system will use the same username and password as the users NSW Health login. The users will need to request access by filling in a form available via the NSW Major Trauma Data Visualisation tool website. Forms will need to be approved locally and returned to ITIM before access is provided. How do I get help on the tool? Other assistance can be sought from ITIM or other trauma service staff that have completed the Qlik training. Qlik additionally provide assistance thought their Help and Community websites, please see below.